Español/Other Languages - Quake Up! 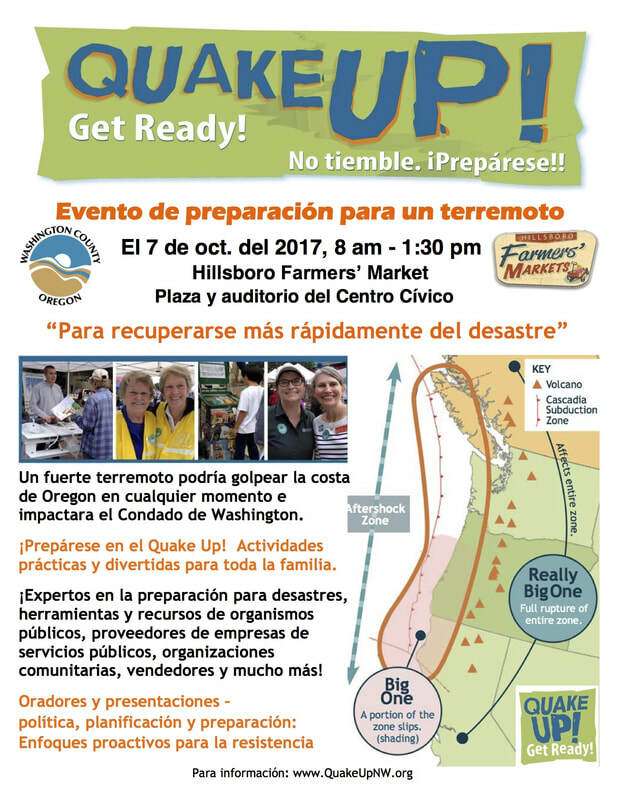 Practical and Affordable Approaches to Get Prepared for a Disaster Quickly, with Your Family, and Community Involvement! Cynthia Valdivia - “No todos los desastres son terremotos” (Presentation in Spanish) - 4:00 p.m.
A veces los desastres pueden ser una crisis de familia; una separación inesperada exige un plan definido. Afortunadamente, un buen plan mejora las posibilidades de superar dicha crisis. Aproveche y asista a la plática sobre este tema. Cynthia Valdivia, educadora de salud pública, presenta información interesante, practica y útil. No se lo pierda. Bio: Cynthia Valdivia is a bilingual/bicultural senior educator for Washington County where she has worked for 19 years. She is the Medical Reserve Corps Unit Coordinator, public health emergency preparedness educator, certified Psychological First Aid instructor, advanced Public Information Officer and certified CERT trainer on staff. Sometimes disasters can be a family crisis; an unexpected separation from family requires a well-defined plan. Fortunately, a good plan can improve your chances of surviving a disaster. Cynthia Valdivia, Senior Communication and Education Specialist will present interesting, practical and useful information. Don’t miss out! Brian Dobecki - WaSH! 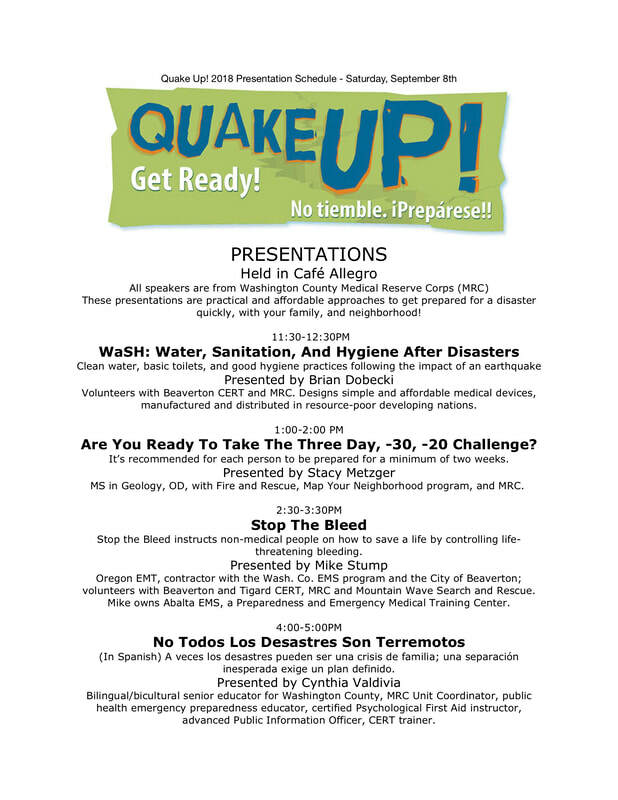 Water, Sanitation, & Hygiene after Disasters - 11:30 a.m. Inexpensive and easy solutions for clean water, basic toilets, and good hygiene practices following the impact of an earthquake on water and sewer infrastructure. Bio: Brian Dobecki is a volunteer with the Beaverton Community Emergency Response Team and the Washington County Medical Reserve Corps. His profession is designing simple and affordable medical devices that are manufactured and distributed in resource-poor developing nations. Stacy Metzger - Are you ready to take the Three Day, -30, -20 Challenge? - 1:00 p.m.
Everyone is talking about earthquake preparedness these days! And you know that it’s recommended that we get prepared for a minimum of two weeks. Right??? But how do you get started? In this presentation, Stacy will show you how you can get prepared for a disaster quickly, at low-cost, and she will make it fun! Bio: Stacy Metzger, MS, OD is a support volunteer with Forest Grove Fire and Rescue and is the Coordinator for the Forest Grove Map Your Neighborhood program, and member of the Washington County Medical Reserve Corps. She is a retired optometrist and has a bachelor’s and master’s degree in Geology. Mike Stump - Stop The Bleed - 2:30 p.m.
Stop the Bleed is a national program, much like CPR/AED, to instruct non-medical people on how to save a life by controlling life-threatening bleeding. It is a program developed by the American college of Surgeons and the Committee on Trauma. Through a short instructional and practice session, everyone can save a life by Stoping the bleed. Bio: Mike Stump - is an Oregon EMT, contractor with Washington County EMS program and the City of Beaverton; Volunteer with Beaverton CERT, Tigard CERT, Washington County Medical Reserve Crop and Mountain Wave Search and Rescue. Mike has been training for over thirty-Five years and currently owns and operates Abalta EMS, a Preparedness and Emergency Medical Training Center. is a network of medical and public health volunteers, along with non-medical community members, who volunteer their skills, expertise and time to support ongoing public health initiatives and assist during disasters and other times of community need. Cynthia Valdivia, educadora bilingüe del Departamento de Salud Pública del Condado de Washington compartió con la comunidad información y consejos útiles para prepararnos en caso de emergencias durante su presentación "Prepárese, no tema: Cosas simples que pude hacer hoy; como parte del evento Quake Up! TVCTV estuvo presente cubriendo este importante evento celebrado en la ciudad de Hillsboro el día 10 de Octubre del año 2015. 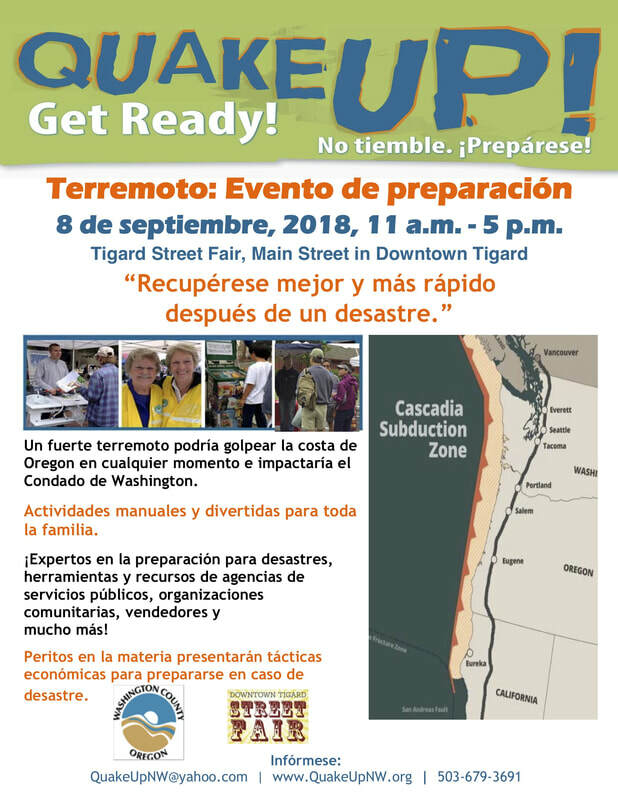 Cynthia Valdivia, program educator with Washington County Public Health Emergency Preparedness, presented “Be Prepared, Not Scared: Simple Things You Can Do Today.” at Quake UP! 2016 in celebrated in Beaverton. Valdivia is a CERT (Community Emergency Response Team) instructor and offers many low-cost or free ways to be prepared. TVCTV was there to capture this informative presentation.